COO Toshiyuki Shiga says Nissan intends to create a new segment with the Juke by combining the power of an SUV with the agility of a sports car. YOKOHAMA, Japan -- Nissan says the high-fendered Juke crossover is aimed at small-sedan and hatchback shoppers seeking a sporty alternative. 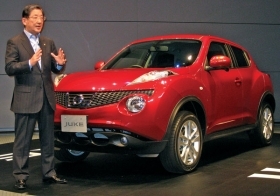 "The intent is to create a new segment," COO Toshiyuki Shiga said at the Juke's Japan launch last week. The goal: combining the power of an SUV with the agility of a sports car. The Juke is the first Nissan to get the company's dual-fuel injector technology, which was announced last year. The system uses two injectors per cylinder -- allowing fuel to flow in reduced streams under less pressure. Nissan says it improves power and efficiency. Europe will be the main market for the Juke. Nissan's Sunderland factory in northeast England will build European versions and the carmaker aims to sell 140,000 to 150,000 Jukes a year, with Europe accounting for an estimated 60 percent to 70 percent of the total volume. Nissan's plant in Oppama, Japan, will build the Juke for other global markets, including the United States. The Juke will go on sale in Europe with two gasoline engines and a diesel unit at the end of September, priced between 16,990 euros and 25,140 euros in Germany. North American sales start toward the end of the year.